As Saint Paul’s only art museum and the only museum in Minnesota focused on regional art, the new Minnesota Museum of American Art provides an exciting opportunity to add vitality to the city’s streets. Planned to occupy a building complex on the National Register of Historic Places, including the Endicott Building designed by architect Cass Gilbert, the central challenge of the project is to create a strong new identity for a 21st Century museum within the beautiful 19th Century historic context of downtown Saint Paul. Using the concept of “Art Block“, VJAA expanded the museum’s concept of outreach to include the branding of other tenant and residential spaces within the complex, including a number of commercial enterprises planned for the skyway level and additional properties. Central to the Art Block concept is the new 35,000 square foot Minnesota Museum of American Art. The first two levels of the Pioneer-Endicott Buildings were designed to meet modern, state-of-the-art requirements for art exhibition and storage, community gathering and teaching spaces, collection management, conservation, and loading docks. Adjacent structures will house restaurants, café, roof terrace, a wine shop, an art salon, and residences. 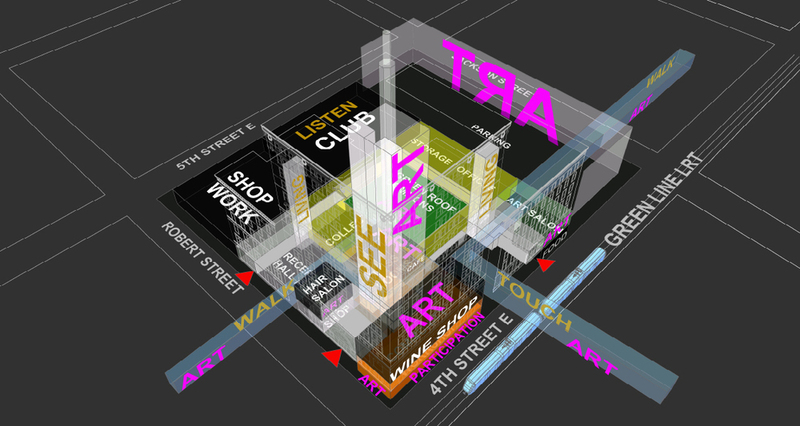 The unified complex of tenant spaces will support museum programming and provide vital and adaptive social activities that support the museum’s mission to expand the arts programming into the larger community.